Spotify just revamped its free tier, which means you get more than ever before without actually having to pay anything—(some) on-demand playlists on mobile, unlimited skips (on a few playlists), and personalized recommendations to more accurately reflect your tastes. So does it make Spotify Premium a waste of money? 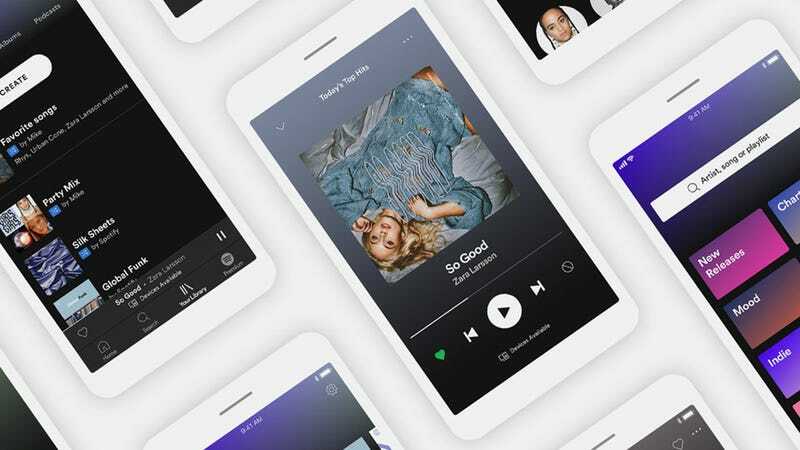 We fired up the newly revamped Spotify app on iOS to take a look at the new features available on mobile and to compare them against what you get with a $9.99-per-month subscription. As far as the desktop apps are concerned, not much has changed, but don’t worry, we covered what few changes there are there too. It’s here that most of the changes to the free tier are centered. Specifically, Spotify is creating 15 personalized playlists for every non-paying user, automatically generated from what you’ve listened to, what you’ve favorited, and what you’ve told Spotify you like. These 15 playlists—which include your daily and weekly mixes, plus lengthy playlists based around your favorite musical genres—shed a lot of the usual free tier restrictions on mobile. You can’t pick what’s in these playlists (beyond suggesting artists and songs you like), but you can play through them in any order you like, and skip through songs an unlimited number of times. Your usual playlists, the ones you’ve created yourself, can still only be shuffled on mobile devices. So you can pick exactly what songs you want to hear, but not in which order—and you can only skip to find the song you want six times per hour. These playlists are marked throughout the mobile app with a blue shuffle icon. What’s more, Spotify will add songs to these playlists with intelligent recommendations. Head into shuffle mode and you might find songs you never put in these playlists (though they’ll probably be by the same or very similar artists). Premium extras and playlists on the free tier. Then there are the ads, cutting in every few songs to prompt you to upgrade to premium or to tell you about something else that you might want to spend your money on. These ads can be jarring when they interrupt the flow of your music, but they’re not a huge inconvenience considering you’re getting access to just about any song you could want to listen to, free of charge. Upgrade to Spotify Premium, and all these restrictions go away. Listen to any playlist you like, in any order, and control your listening experience song by song. There are no skip limits on any of the playlists, and no adverts at all. New discovery and playlist options. A few other very useful extras come with a Premium subscription: The option to download music to your devices, so you don’t have to stream songs while you’re away from wif, and access to the Extreme music quality level (320 kbit/s rather than 160 kbit/s). Those alone might make the Premium subscription worth it to you, depending on your listening habits on mobile. So all that’s really changed on the free tier for Spotify, as far as mobile apps go, is that it’s now easier to tell Spotify what you like and don’t like—and on top of that you get 15 “Pick and Play” playlists with recommendations that you can play in any order and with an unlimited number of skips. It doesn’t actually move the needle too far in terms of free Spotify versus Spotify Premium, and doesn’t give you that much more control over your music. There’s much more parity between free tier and Premium users when it comes to Spotify’s desktop apps. The skip and shuffle restrictions are lifted for non-paying users, so you can queue up whatever tunes you like, in whatever order you like, and without any random recommendations inserting themselves between your chosen tunes. The adverts are still there, arriving every handful of songs, and they remain perhaps the biggest difference between free and Premium accounts on the desktop. Ostensibly they are helping to cover costs for those 90 million users on the free tier. Other limitations for non-paying users on the desktop are the restriction on the streaming quality of the tracks and the blocked access to the offline download option. This isn’t so important on the desktop, when you’re likely to be on wifi all the time, but it helps while traveling and on patchy wireless networks. It’s worth mentioning that the iPad’s large screen means it qualifies as a desktop device—you can use the iPad app just as you can the desktop app on the free tier, so the ability to play any songs you like in any order you like, with adverts interspersed. If you do most of your Spotify listening on a laptop, desktop computer, or iPad rather than a phone, then the restrictions on free users aren’t going to hit you as hard. You’re essentially dealing with regular audio adverts, and no access to offline downloads or higher quality music. Whether that’s worth the trade-off is up to you. For those who spend a lot of time listening on mobile, paying for a Premium subscription to get the full Spotify experience is much easier to justify. If you don’t, you’re basically listening to music Spotify recommends for you in the mobile apps, plus a few tracks you’ve picked out thrown in on top. It’s well known that Apple Music doesn’t offer a free tier and seems happy to differentiate itself from Spotify in that way. If you really don’t want to pay for Spotify, and you find the free tier a little too restrictive, what are your other options? In terms of competing music streaming services, Deezer offers a free tier with similar restrictions to Spotify: It’s unlikely that you’d swap from one service to the other as a non-paying user, because you’re basically getting the same experience through differently designed apps. Deezerr’s shuffle mode is called Flow. At the time of writing, Google Play Music still exists and has a free option—but unless you pay you’re relying on uploading tracks you already have. So you’re still going to end up paying for your music in the end. More attractive is the service that Google Play Music is tipped to soon fold into, YouTube. This is already a popular source of free, ad-supported music for millions of us, and the rumor is that Google will take that further in the future. You can already do plenty with YouTube and music: Put together mixes, create customized playlists, and even queue up songs on a Chromecast. Like the free tier of Spotify, you have to put up with a few adverts, but you can at least choose the songs you hear and in what order—even if extras like background playback on mobile and offline caching aren’t yet anywhere to be seen. YouTube is a free music destination for many. Internet radio and services such as the free version of Pandora are yet another option, though there you’re really relying on the taste of human DJs and coded algorithms rather than being able to queue up the tracks you actually want to listen to. While Spotify Premium remains a distinct cut above Spotify Free, the free tier remains one of the best places to go for a huge music catalog that won’t cost you anything to listen to. In terms of breadth of music and features offered for free, it’s only real rivals are Deezer and YouTube, which makes Google’s plans all the more interesting.